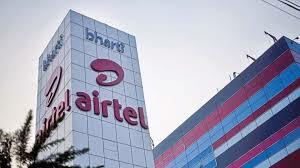 On a consolidated basis, Bharti Airtel's net profit fell 71.81% to Rs 86.20 crore on 0.99% increase in net sales to Rs 20,519.20 crore in Q3 December 2018 over Q3 December 2017. The result was announced after market hours yesterday, 31 January 2019. Hero MotoCorp's net profit fell 4.5% to Rs 769.10 crore on 7.5% increase in net sales to Rs 7,864.82 crore in Q3 December 2018 over Q3 December 2017. The result was announced after market hours yesterday, 31 January 2019. Power Grid Corporation of India's net profit rose 14.2% to Rs 2,331.17 crore on 12.8% increase in net sales to Rs 8,471.17 crore in Q3 December 2018 over Q3 December 2017. The result was announced after market hours yesterday, 31 January 2019. On a consolidated basis, Vedanta's net profit fell 21.06% to Rs 1,574 crore on 2.84% decrease in net sales to Rs 23,669 crore in Q3 December 2018 over Q3 December 2017. The result was announced after market hours yesterday, 31 January 2019. On a consolidated basis, UPL's net profit fell 19.69% to Rs 461 crore on 17.33% increase in net sales to Rs 4,921 crore in Q3 December 2018 over Q3 December 2017. The result was announced after market hours yesterday, 31 January 2019. Berger Paints India, Dr. Reddy's Laboratories, State Bank of India and Titan Company will announce October-December 2018 quarterly results today, 1 February 2019. Dewan Housing Finance Corporation (DHFL) announced after market hours yesterday, 31 January 2019, that the audit committee of the board of directors of the company has appointed an independent chartered accountant firm to verify the allegations made in the complaint and submit a report in a time bound manner. Yes Bank announced after market hours yesterday, 31 January 2019, that Reserve Bank of India (RBI) has approved the appointment of Mr. Ajai Kumar as interim MD & CEO of the bank from 1 February 2019 for one month or till Mr. Ravneet Gill assumes office as MD & CEO, whichever is earlier. MOIL announced after market hours yesterday, 31 January 2019, that it has decreased the prices of Ferro Grade and Chemical grade by about 5% on the existing prices prevailing since 1 January 2019 and continued the prevailing prices of the Silico Manganese Grade (SMGR 25% & SMGR 30%) and Fines. The company will continue the prevailing discount of 10% on the price effective from 1 February 2019 and also continue the existing bulk quantity discount ranging from 5% to 20% on the select grades of non-moving low grade manganese ore. Ferro Manganese/ Ferro Manganese Slag and some identified grades of Manganese Ore will continue to be sold on e-auction basis as well as through Metal Mandi (M3) of MSTC.